BEVERLY — Holly Simon welcomed her son Nate into the world on Nov. 26, 2003. But rather than congratulate the exhausted mother, the nurse apologized. 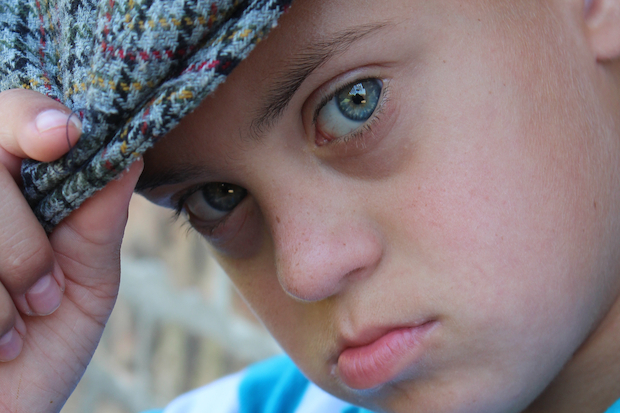 Nate Simon showed early signs of Down syndrome. This meant doctors, nurses and specialists immediately turned to a script that focused on the baby's diagnosis and future medical needs. The opportunity to celebrate Nate Simon's arrival into the world was lost forever. HollyDays is rooted in that moment. The annual celebration returns from 6-10 p.m. Saturday at the Beverly Arts Center, 2407 W. 111th St. Tickets cost $30 at the door. Upward of 700 people are expected to attend the fundraiser for Holly Simon's foundation, I am who I am, which was launched by the Beverly mom in January 2012. The foundation distributes baby blankets to three area hospitals for children born with special needs. I am who I am also works with maternity doctors, nurses and medical staff to train them on how to communicate with parents, friends and family of newborns who arrive into the world a bit different. "The main goal is to say, 'Congratulations on your beautiful baby!'" Simon said. HollyDays actually began as an Oktoberfest-style block party in 2006. Simon invited friends and neighbors to the party and sold handbags she had made while Nate was receiving therapy. The profits were initially donated to the National Association for Down Syndrome. From these humble beginnings, the event continued to grow. A vendor fair now includes 20 artisans, including jewelry makers, painters, holiday crafters and more. Several of the vendors are special-needs children. A pair of live bands will also entertain the crowd as will celebrity bartenders serving Holly-Tinis. CBS-2 anchorman Rob Johnson and Grammy-winning song writer Damon Ranger are among the notables expected behind the cash bar. The annual photo gallery highlights HollyDays. Some 30 children are selected each year to have their photographs taken professionally. These photographs are on display at the benefit and aim to show the beauty within every child, Simon said. "This is all about celebrating our children," she said. Simon works with Little Company of Mary Hospital in Evergreen Park, Advocate Christ Hospital in Oak Lawn and Adventist Hinsdale Hospital. She hopes to someday bring her baby blanket and training program to all hospitals throughout the Chicago area and eventually expand the program nationwide. To this day, Simon still hears horror stories of the way parents of newborns with special needs are treated. One hospital employee told a mother to leave her newborn at the hospital so someone else might adopt the baby, she said. Simon vividly recalls a doctor telling her that Nate would likely have a low sperm count as an adult just before she left the hospital with her newborn son. And while that information was somehow deemed pertinent, a simple congratulations was not, she said. "He turned into this amazing gift from God that changes people's lives," Simon said. Nate is the youngest of Holly Simon's five children. Her husband, Dan, works as a lieutenant in the Chicago Police Department. She was also recently diagnosed with breast cancer and is undergoing treatment, though that doesn't seem to be slowing her down ahead of HollyDays. "This gives me a reason to live," she said.